Traralgon and District Adult Riders Club was formed in the year 2000 and has been through many changes over the years. TADARC is primarily a HRCAV club with members who compete in Dressage, Showing, Eventing and Showjumping. 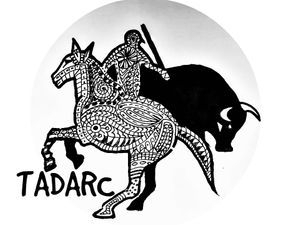 In recent years members have also taken an interest in Working Equitation so TADARC has affiliated with Australian National Working Equitation and runs training days and competitions. The membership year commences on Nov 1st 2016, so renew this month to be sure that your membership and insurance does not expire. TADARC membership includes both HRCAV and ANWE affiliations, a club for everyone. In April we had Sofia Valenca from Portugal giving half day clinics as an introduction to the Valenca Method of horse training. Participants refined some basic skills in lunging and in-hand work before progressing to the ridden part of the lessons. Our first Working Equitation Competition was such an exciting day. Entries were full and it was wonderful to see so many people out giving it a go. There was such a range of riders, from those who have never competed before at all, to experienced dressage riders and working equitation enthusiasts. 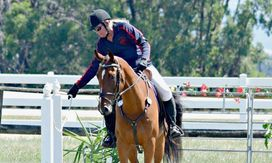 Pictured jer is Rose Palm of Koo Wee Rup Riding Club, riding her australian stock horse Grady's Blue Illusion. This combination were winners of the Preliminary (Section B) Championship. See our facebook page for results and more photos. Thank you David for supporting this event by sponsoring the intro class. This is an important class where inexperienced riders can compete at a walk and trot over a simplified obstacle course. A great introduction to competition and Working Equitation. Alpha Dog Beds has a great range of dog beds for sale in their online store. Visit https://alphadogbeds.com.au and find the perfect dog bed today.